Braduate Blog Could your goals be holding you apart from happiness? Can you remember how old you were when you first set an important goal? Maybe you were at school and decided you were going to study hard and get good grades or gain a place on a sports team? Perhaps it came later when you identified your dream career and diligently prepared for an interview? Or even further down the career path when you were seeking out a promotion or starting a new business? By adulthood, everyone knows how goal setting works — identify where you are now, figure out what you want and then work to close the gap between the goal and the reality. Seem straightforward enough? This is where most of the Western world (especially business) is right now, relying on traditional goal-setting techniques as the path to success and ultimately, happiness. But what if the concept of goals is fundamentally flawed? What if instead of creating more happiness, your goals were actually keeping you apart from it? Think about any goal that you have for your life right now. What do you imagine that achieving it will give you? Why do you want the money, the promotion, the relationship or the body beautiful? Isn’t it because you think you will feel better when you have it? In fact, all goals are really attempts to create those good feelings we all aspire to. But anytime you set a goal, you create a gap between your current reality and some imaginary point in the future when your endeavours have been successful. We associate the good feeling to the achievement of the outcome, and, in doing so, deprive ourselves of feeling that way in the here and now. In other words, you have decided that you can’t have the feeling that you want until you have achieved your outcome, and have inadvertently created an “I’ll be happy when…” pattern. I’ll be happy when I escape this job (so I can’t feel happy now). I’ll feel successful when my business turns over two million pounds (so I can’t feel successful now). I’ll feel loved when I meet my soulmate (so I can’t feel loved now). I’ll feel free when I have paid off my mortgage (so I can’t feel free now). Instead of focussing on the goal you want to achieve, put your energy into the person you want to become in accomplishing it. Or said differently, don’t wait to feel good, feel it now—and let the results flow from there! For example, if I want to escape my current job, then how do I need to be feeling to create that opportunity? Motivated? Determined? Calm? Isn’t it possible to be all of those things right now? You don’t need your outer situation to change in order to choose to feel differently inside. Not only will you feel better in the process, but you also enhance the chances of it happening. How much more likely are you to get a new job if you are already feeling good (rather than feeling desperate, frustrated or demoralised)? When we focus on how we want to be rather than what we want to achieve, we stop depriving ourselves of good feelings and holding ourselves apart from happiness. Moreover, we expand the field of possibilities and we begin to realise that our goals were only ever about the person we were becoming in the process of achieving them. And then maybe—just maybe—we don’t have to wait for happiness; we can choose to have it right now. 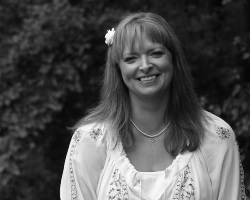 Tiffany Kay studied Interdisciplinary Human Studies at the University of Bradford from 1989-1992, and now works as a coach/consultant for entrepreneurs, over-achievers and SMEs who want to escape the pursuit trap and find true fulfilment. She helps people who are stuck, frustrated, overwhelmed or burnt out to discover their inherent value, ditch unnecessary complexity and drama, and learn to live in the now.